Thinking about a Home Theater here in Thailand? We can turn an unused space into an Amazing room for you and your family to enjoy all the latest Movies. Whether you are building a new dream home or have an unused space in your current one we can build you a custom home theater so you, your family and friends can enjoy an awesome movie watching experience. Immerse yourself with Fantastic, jaw dropping visuals,razor-sharp lifelike images and spine tingling audio in your own Home TheateR. We believe that watching movies on the big screen should be all about fun, we design and engineer rooms that allow you to immerse yourselves in film with razor sharp High Definition images and spine tingling audio. Our custom built home theaters can be seen all over Thailand but generally we work in Phuket, Chiang Mai, Hua Hin and Bangkok. Our design and consultancy services are available worldwide and some of our home theaters can be seen as far afield as the UK, the USA and closer to home in Myanmar Burma) and Hong Kong. Scroll down to read about the home theater design process, Scroll further to learn about our previous installations here in Thailand and some of our unique home cinema products, like acoustic foam, fibre optic starlight ceilings, popcorn machines, and at the bottom a Home Cinema FAQ. We had Ben and his team at H3 Digital perform works at our villa including a split audio system between the pool and bar areas and the installation of the home cinema including projector, retractable screen and speaker set-up. I wanted a professional Home cinema setup in my house but I wasn’t too impressed with what was for sale in the retail shops as we had a large space and I wanted a full THX system. Designing a Home Theater System starts out with you the customer, we listen and try to understand how you will be using your home theater, and use our extensive knowledge (We are both CEDIA and THX certified) and experience to help bring your home cinema to to life. We meet with you or your representatives and listen to what you want from a home cinema or media room. we take time to understand what you will be watching, the sort of movies and TV series you enjoy and what sort of home theater style and seating you envision. It’s a great time to ask us any questions you might have regarding surround sound, screen size or what the lastest in 4k and HDR technologies really bring to the table. Our initial home theater proposal gives you an idea of what to expect in terms of cost and timescales. Some clients go with our first proposal but generally people make subtle changes to tailor the home theater to their ideas, perhaps they want more or bigger subwoofers, a bigger screen or a custom colour from our hand made home theater recliners. A conceptual plan is drawn up, this non-technical drawing is used for further discussion and ideas. It will give you an idea of the overall layout, where the seats are, how big the screen looks in the room. This is the final technical plan of your home cinema and is used by key stakeholders to build and fit out your home cinema with precise dimensions and cabling/hardware plans. Whether you are looking for a living room, media room or dedicated cinema, good design at the start will be key to having the best possible home theater experience. Before meeting with us it is worthwhile having a quick think about the following so that your very own home theater is exactly what you want. The bigger the screen and the more comfortable, the better but a home theater can have a screen that is too large (we generally don’t go above 150”) so it’s worth talking to us if you have any questions about viewing angles and distances. What home theater screen size would you like? Think BIG Screen as 4k and High Definition content means brilliant, bright, sharp, detailed images at any screen size. Projector or TV based home theater? Do you want a dedicated home cinema room with home theater projector and screen or a big TV in a media room. If you have a spare room or space under the swimming pool, a dedicated room is great fun - Just think, you’r very own home theater with you can use a projector and fit in some cool home theater recliners - a Living Room or Media Room setup can also be great fun and a central focal point for the family. Home Cinema typically starts at 5.1 surround sound for the basic home theater package, that's 5 speakers (Left, Centre, Right, Rear L, Rear R) and a Subwoofer. For larger rooms a 7.1 or 9.1 setup or even Dolby Atmos setup might suit, Dolby Atmos adds additional ceiling speakers to give a feeling of height and depth to sound effects. Dolby Atmos is normally written as 7.2.1. The first number is the amount of surround speakers, the second number the Dolby Atmos height speakers and the last number is the amount of subwoofers in the theater. H3 Digital have designed a variety of dedicated home theaters over the years and for almost every budget. Our home theaters significantly outperform others at a similar price level because of our expert knowledge and experience, we know what home theater equipment works best, gives the best value and produces amazing results. Whether you are looking for an entry level cinema, media room or a full dedicated home theater - talk to us and let us design and build something you are going to enjoy for years, decades even. Our experts are fully qualified and have been working with high end home cinemas for over 15 years. We are THX and CEDIA certified and all of the home cinema installations you see on this page are actual installs for happy customers. We offer design and build services for home theaters all over Thailand. Our main offices are in Phuket and Chiang Mai but we often work in Hua Hin and Bangkok, Overseas work is taken on a case by case or consultancy basis. For custom home theater work we can work alongside your Architect, Project Developer, Builder and Electrician, At every stage of your home theater we will make sure that all key stakeholders have comprehensive plans and are aware of the technologies, time and issues involved. Designing the home theater properly is key top getting our clients an amazing home cinema experience. Our design skills are second to none, our staff are THX and CEDIA certified and have designed and built both high end and cost effective home theater solutions for over 15 years. 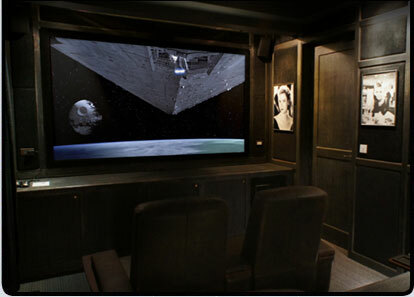 With the proper home theater design we can correctly engineer and build out the theater room. It’s paramount that home cinema is properly setup and configured - we make sure that you get the only the very best out of your system. We want you to have the most enjoyable movie experience possible. Geometric shapes and patterns are used to measure and tune settings to perfection. THX and CEDIA qualified, we use a range of audiovisual and video test signals to measure and adjust colour, sharpness, tint, bass, treble, delay and a host of other settings so that your home cinema looks and sounds absolutely amazing. It’s our attention to detail, knowledge and experience that make our home theaters outperform others of the same cost. We have a reputation for getting the very best out of your equipment, our work outperforms other home cinema installs costing significantly more. We design and install throughout Thailand including; Phuket, Hua Hin, Bangkok and Chiang Mai. Our cinema designer (and MD) Ben Hobbs is CEDIA and THX certified and can help engineer a custom home theater room just for you, helping to bring your home to life. Ben has trained closely in the USA, Australia and China with some of the most talented and respected individuals in the home theater industry. This Home Cinema was completed for a customer on the West coast of Phuket. A retrofit install, there was an unused area underneath the swimming pool after he'd completed construction of the villa, we were asked to turn it into a home cinema. This home was featured in KNX today as a Smart Home case study. 92" HD Grey Screen, leather cinema recliners, 5.1 surround sound, media centre, 1080p video projector and one-touch remote. This Cinema was built for someone in the film and TV industry in their Phuket villa, they wanted an area they could escape to and watch movies. This home cinema is just off the Master Bedroom and required acoustic material to isolate the sound inside the room. 100" Cinema screen, 5.1 surround sound (rears are in-ceiling), 1080p video projector, Xbox and one-touch remote. This cinema was designed specifically to offer the very best in image quality, muted blacks and dark colours throughout help to control light levels and really make the image on screen POP. The villa is rented out on a regular basis and the home cinema room is a real hit with the guests. 100" High Definition Screen, leather cinema recliners, 7.1 surround sound, 1080p projector, Media centre and one-touch remote. This home cinema is a relaxing fun room, featuring wood paneling and silk padding on the walls - As well as helping the acoustics the design looks great. The comfy wide sofas and cushions invite you to sit back and enjoy the movie. A one-touch remote control from harmony makes it easy to control, press one button and the A/V receiver, DVD Player, Apple TV, Media Centre, Projector and Aircon all turn on. After watching your movie one button turns it all off. 92" Screen, 5.1 surround sound, 1080p projector, media centre, AppleTV and on-touch remote. This beautiful cinema was completed for a repeat customer of ours, he wanted an entertainment areas that really stood out for his guests, friends and family to enjoy. Nine motorised recliners, plush carpeted floors and mood lighting make it feel like a very special experience. 120" HD Grey Screen, motorised leather recliners, starfield ceiling, Marantz 5.1 THX surround sound with two 12" subwoofers, 1080p projector, media centre, Playstation, Xbox and one-touch remote. This Amanpuri villa in Phuket had a large unused space that the owners wanted to make better use of. A custom 8 seat Dolby Atmos 4k Home Cinema was designed and features a starlight ceiling with Ferrari style latte colour motorised leather home theatre recliners, carpeted flooring and in-wall/in-ceiling speakers. 120” Cinema Screen, 4k projector, Dolby Atmos surround sound, fibre optic starfield ceiling , 12”Sub woofer, media centre, Apple TV and one-touch remote control. This colourful cinema was completed for a customer in Hua Hin. The front speakers are mounted into the front cabinetry to give the whole front stage a nice clutter free feel. The owner completed the decor with custom curtains and wall stencils. 100" High Def Grey Screen, Onkyo 5.1 surround sound with one 12" subwoofer, 1080p projector, media centre, Blu Ray player and one-touch harmony remote. This THX Home Cinema features a motorized screen that drops down in front of a special display cabinet housing a collection of rare, model Ferrari cars. The front Klipsch speakers and subwoofer are designed into solid concrete to isolate them from the cabinet and eliminate vibrations. 120" Drop Down Motorised Screen, Onkyo THX 7.1 surround sound with Klipsch speakers and 12" Klispch subwoofer , media centre, Blu Ray Player, one-touch harmony remote control and Philips Hue Smart Mood Lighting. We've been installing home theatres since 2004 and have successfully completed many installs, below are some of the other great cinemas we've installed for home owners in Phuket, Chiang Mai, Hua Hin and Bangkok. As well as custom designed home cinemas, media rooms and entertainment centres we also supply a range of custom made cinema equipment to trade and retail throughout SE Asia. Hand made custom theatre recliners, made right here in Thailand using the finest in Italian Leather. These can be fitted with motors for the ultimate in luxury cinema seating or are available in a manual recline. Being custom made for us these are available in just about any colour/finish you wish. The seats are a modular system and they can be configured for any size or style of room. Available in single seat, love seat and bench seat or a mixture - however you need them. Choose simple arms or add cup holders or tray / remote control holders. Every time we install our custom home theater recliners the customer has been very vocal in how much more they find themselves enjoying the movie, how much better the theater room looks and feels. if you want the genuine, full on, 100% authentic movie theatre experience (or you just really like popcorn) then you need one of our cool popcorn machines. They don't just make your cinema look great but they make brilliant popcorn as well. We also rent the popcorn machines out on a daily basis and sell ready-to-pop popcorn, so if it's just a special occasion or a one off get in contact with us to reserve your machine and choose your flavours. We can design and install acoustic treatments for your wall to ensure you are getting crystal clear sound, and spine tingling bass. Treating your room acoustically with foam will not soundproof your room, to do that you would need to ISOLATE the room. Foam treatment helps to address reverberation, echo and slap by absorbing and reflecting sound waves. By engineering the theatre room for the best sound experience it not only makes voices more intelligible, it also improves the surround sound and clarity of music you are listening to. For that finishing touch to a home cinema, or if you just want the feeling of sitting under the stars at night, get one of our fibre optic star ceiling kits. A starlight ceiling can help transform an entire room into something very special - an amazing home theatre. With our Smart Home systems you can even connect the Star ceiling to your lighting control system, dimmer or home automation to really make it sparkle. Home cinema implies a real “cinema experience” at home, normally a dedicated room for watching movies and tv on a BIG screen. A cinema room is expected to add value to your home and become a focus for entertaining and family nights in. Home Cinema, Home Theatre or Home Theater? Now this is a tricky one, Home Theatre (in the UK) or Home Theater (In the US) used to be the popular name for a dedicated movie watching room but Home Cinema seems to be the de rigueur term, some people also call it a media room although this is more likely a mixed use room, rather than a Theater room dedicated to big screen movies and television. Whats in a Home Cinema? A large screen - from 72 inches to 150 inches (measured diagonally) either projection or an LED TV. The sound system will feature an amplifier (home theatre receiver) which powers either 5, 7 or 9 surround sound speakers (Dolby Atmos adds ceiling speakers) and a subwoofer or two for Bass. You will also need a source so that you can get hold of 4k, HD and HDR content. High definition sources include Blu Ray Discs, Playstation 4, Xbox, AppleTV, Amazon Prime, Netflix and Media centres, which store movies and TV series that you can browse on your home theater screen via a gallery. Excellent, High Definition (1080p) and 4k sources are available that are crystal clear at huge screen sizes. Projectors offer a better film experience but Tv's are sometimes more practical when a dedicated theater room isn’t required or available. Projection based cinema will need light control (being able to turn lights off and close curtains). a 4k Movie in HDR can look jaw droppingly good, if you haven’t seen projection based home theater in the last decade or so I suggest a viewing - It’s come on so far since the old days of CRT and low resolution Projectors. Also known as UHD (Ultra High Definition) it refers to a horizontal resolution of 4,000 pixels for home TV and Movies this will be 3840 × 2160 pixels. The extra pixels allow you to pick out more detail from images, they look more life like - the bigger the screen, the more your eyes are physically able to draw more detail from the image. Yes, Netflix and Amazon prime have a lot of their TV shows and films available in 4k resolution and some Blu Rays support 4k as well, although the industry is generally pointing towards streaming services, discs will probably not be around for much longer. Every home theater room is unique and everything inside that space will dramatically change the way it sounds. We work to make sure that your room sounds amazing, by choosing the right home cinema amplifiers, speakers and subwoofer we ensure that it sounds great - we can recommend and install treatments and acoustically engineer the space to take it to the next level. Can home theater speakers be used for music? Yes and indeed for some music can sound amazing when it’s setup properly - Firstly we make sure that we partner your home theater speakers, amplifiers and subs with a multi room audio source like a Sonos Connect, Nuvo p300 or AppleTV and then we can program your all in one remote control for a music setting on the amplifier (both Dolby and DTS have stereo/music modes). How do I control it all? Easily, our touch screen all-in-one remotes turn on all of the equipment with a single button press, turn everything off at the end with another button press. Can I hide all the speakers? Yes we can build speakers into walls, cabinets, ceilings and columns so you don't see them. Traditional surround soundtracks confine all sounds to the 5.1 or 7.1 channels of a typical home theater setup, Dolby Atmos adds one or two pairs of overhead speakers (a height channel) as well for added immersion, such as when a helicopter flies directly overhead. Wherabouts in Thailand do you install? 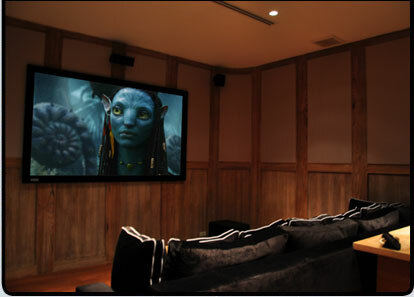 We install Home Theatres in Chiang Mai, Phuket, Bangkok and Hua Hin. Do you install in other countries? H3 Digital have installed home cinemas in Hong Kong, United Kingdom and Myanmar. We welcome inquiries from these and other SE Asian countries. It's more affordable than many think, our budget packages start at around 249,000 Baht but typically our custom installs fall into the 300-850,000 baht range. High End cinemas can be considerably more expensive with motorised leather seats and special acoustic design and treatment.